Are you thinking of building a koi fish pond? Keeping these magnificent fish in your garden can be great fun and it is not as difficult as you might think. With the right care koi can live for decades and some can become almost a meter long. Follow these tips to plan your pond properly so your koi will live long and happy life. Small ponds are not suitable for koi. Remember, with time koi can grow quite large and they will need a lot of room. Also there are so many color variations of koi, that with time you will probably want to add more fish to your pond. So it is better to create a large pond from the start than rebuild it later. About ten thousand gallons is a good size for a koi pond, bigger would be even better. When selecting a spot for your pond, make sure it is out of direct sunlight. Also keeping water plants like water lilies in your pond are a good idea – not only they add beauty to the overall design, but they also provide shade for the fish. However, you should avoid building your koi pond under trees. Cleaning a fish pond of fallen leaves is no fun. There are many birds of prey that would love to steal your koi. Don’t give them the opportunity; plan your pond location so it is possible to cover it with a net. When landscaping your pond keep in mind that you should not use any insecticides or herbicides near the water. Even a small amount of common garden poison can kill your beautiful fish. Several accessories are absolutely essential for a healthy koi pond. Ideally you will have to invest into a water pump, filtration system, water aerator and an ultraviolet sterilizer. If the water in your pond is still, your fish might get sick and eventually die. Koi pond filtration systems are expensive, so as an alternative you can make your own homemade filters. There is much more to building a koi fish pond . 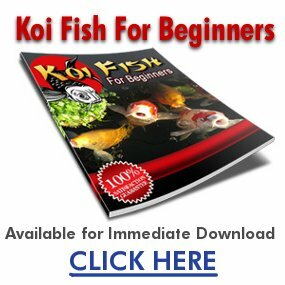 Visit Koi Fish Ponds for more information about installing and maintaining koi ponds.